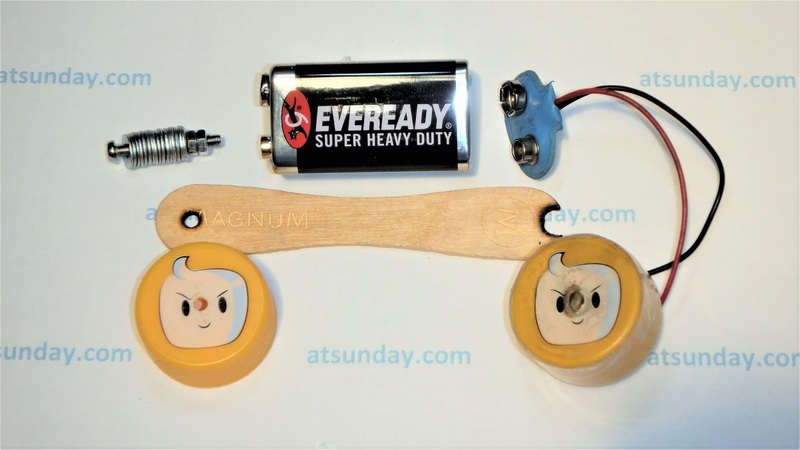 Motorcycle toy can be made easily at home, with only household material such as: 2x pieces of plastic bottle cap, ice cream stick, 9 volt battery, battery clip, dc motor, M3 bolt with some rings and nuts, and rubber band. The following video shows the motorcycle test shortly after it has been assembled. It can be seen that motorcycle runs quite fast, although the battery is not new and has been used for testing many times. As the above video snapshot, at the 6th to 7th seconds in the video, the motorcycle runs straight for about 1.1 seconds. It can be seen clearly in slow motion video. 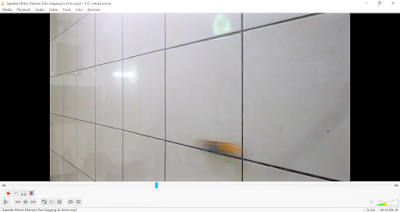 The distance in the video can be estimated by the number of ceramic tiles, where the length of 1 tile is 30 cm, total 7 tiles, so the distance is 30 x 7 = 210 cm. Read also boats and submarines science toy which can sail, dive and resurface like the real ones. The photo above show materials used. The first step is to make a mark in the center of the plastic bottle cap. The first stage to make motorcycle toy can be seen in below video. The second stage of motorcycle making procedure can be seen in below video. The following photos show and explain the procedures performed. Shown in the photo above a vernier caliper is used to determine the center point of the bottle cap. By measuring the outside diameter of the bottle cap, then divided by 2 to get the center point. 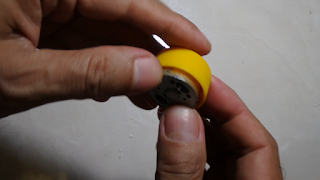 Diameter of bottle cap should be larger than the dc motor body. And the width of bottle cap lips is slightly smaller than the width of the motor body. The shape of the bottle cap must be cylindrical. So that the bottle cap can roll in straight line. 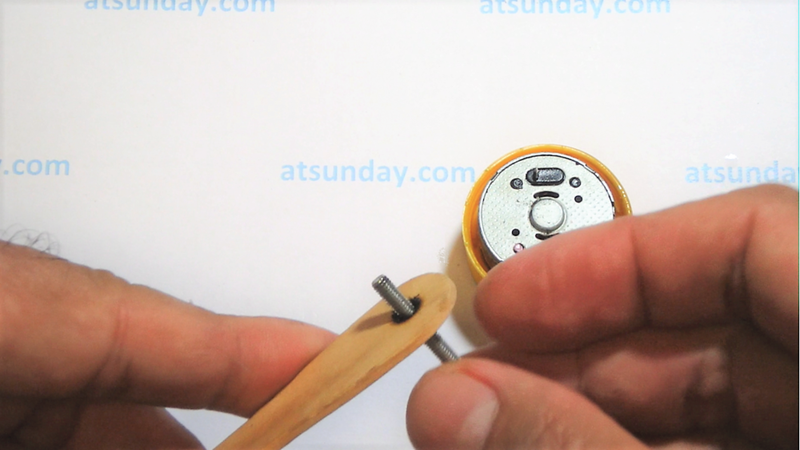 Then the bottle cap is drilled as shown in the photo above. The size of the drill bit is equal to the motor shaft size of 2 mm in diameter. This bottle cap will become the rear wheel. 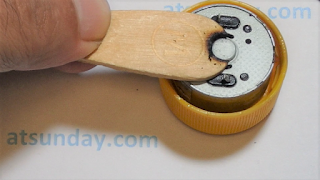 The motor is oiled on the face so to avoid friction on the inside of the bottle cap. 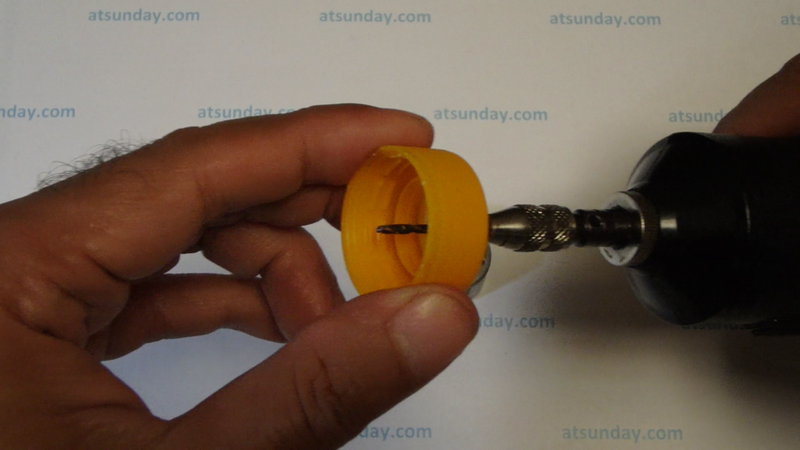 No oil on the motor shaft, to avoid slip with the bottle cap. Apply a bit glue to the hole on the inside of the bottle cap to stick with the motor shaft. 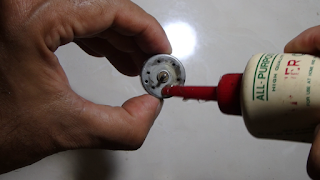 Attach the bottle cap to the motor by pressing the motor into the bottle cap, until the motor shaft gets through. 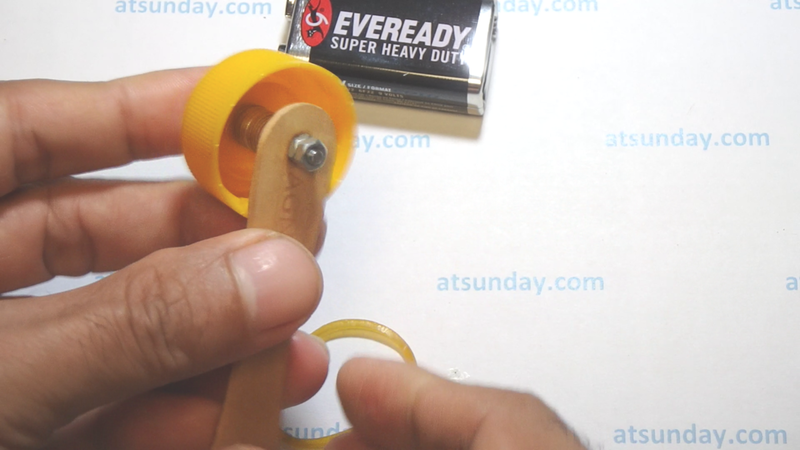 It can be seen that the width of the motor body is slightly wider than the width of the lip of the bottle cap, so that the bottle cap lip will not rub against the frame. This motor is commonly used for DVD players, rated voltage of about 1-6 volts. The diameter of the motor body 24.5 mm, width 12.5 mm, shaft diameter 2 mm, and 7 mm shaft length. 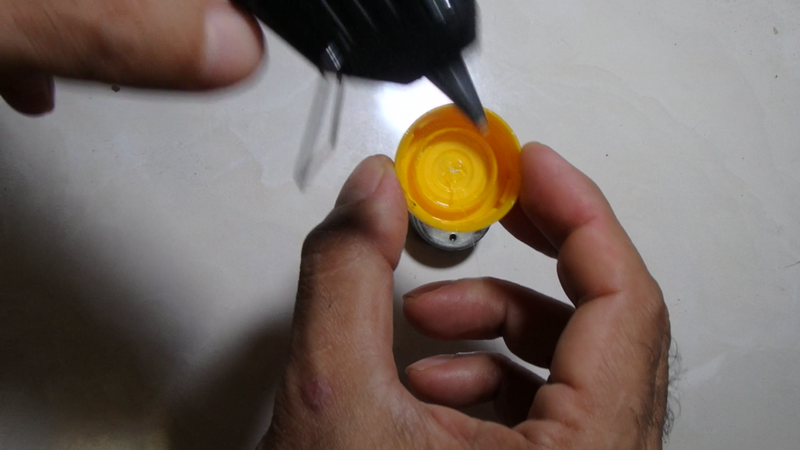 Apply glue on the top of bottle cap to make the shaft sticks stronger to the cap. 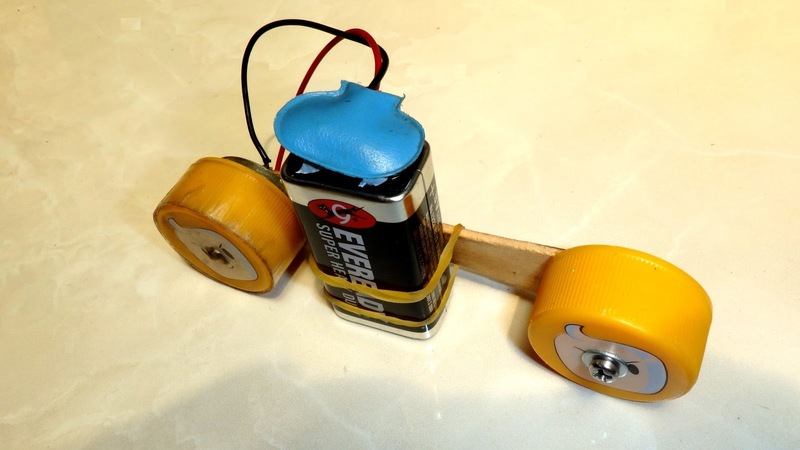 As a rear wheel, the connection between the shaft and the bottle cap must withstand to the power of motor. Bottle cap as rear wheel should be given anti slip on the outer lip, it is like rubber on tire. 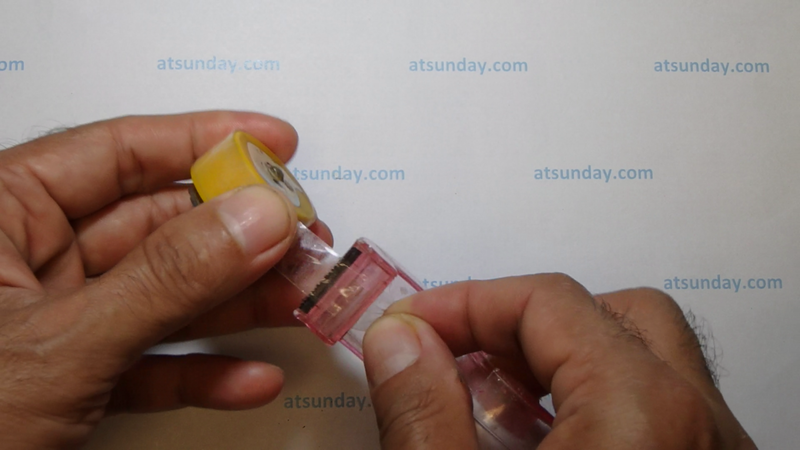 The anti slip is a clear insulating tape wrapped around the cap several times. Prepare an ice cream stick, like Magnum ice cream as the photo above. 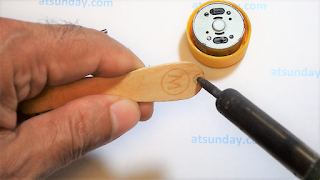 Create a notch on one end for the motor. 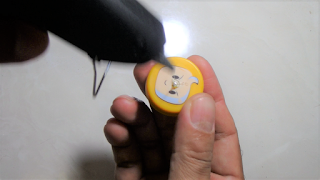 Notch can be made by using soldering iron. 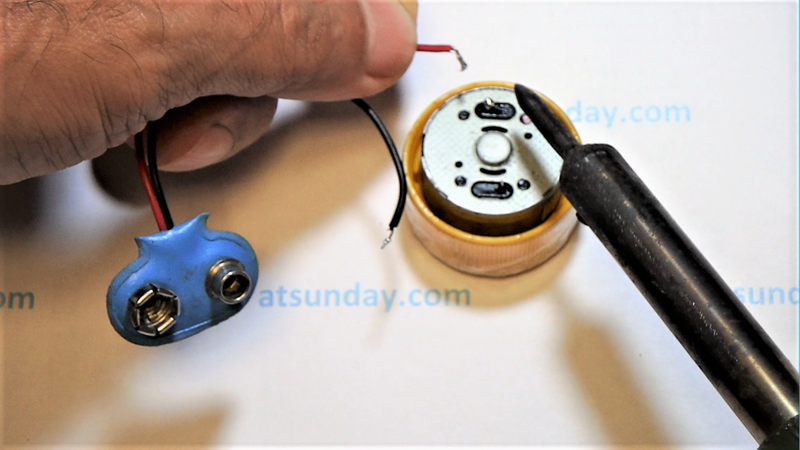 Notch will ensure the motor can be installed neatly because of a bulge on the center of motor. Create a 3 mm diameter hole at the other end to be fitted by M3 bolt. 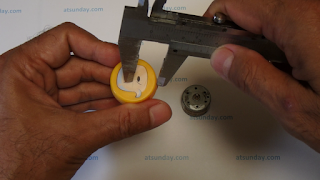 The hole can also be made by soldering iron. This hole will be used to install the front wheel. 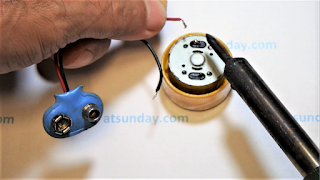 The battery clip is soldered to connectors on the motor. Make sure the direction of motor rotation, to ensure motorcycle will move forward, with the rear wheel as the driver. If the motor turns in reverse direction, it may also be considered that the motorcycle is moving forward with the front wheel as the driver, or front wheel drive. The photo above shows all components before being assembled into a motorcycle. Motor is glued to the ice cream stick. 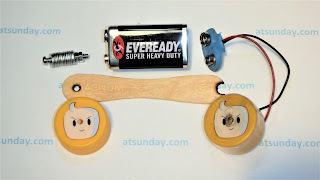 Notice the side of the stick that is affixed to the motor, as it will determine whether the motorbike will move forward or backward. 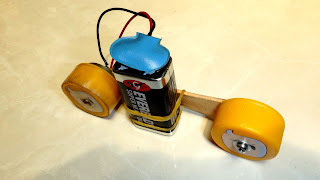 The front wheels are fitted with a 25 mm long M3 bolt with about 18 pieces of spacer ring between the wheel and the ice cream stick, so that the front wheel do not rub the stick. The length of the bolt and the number of spacer rings are determined by the width of bottle cap lip. Wheel bolt is tied with 2x nuts, one nut will lock the other nut or also called locking nuts. The front wheel is mounted on the same side of the ice cream stick with the rear wheel. How to install a counter nut is, fit the first nut until the front wheel is a bit tight when rotated. Then loosen the first nut a few degrees until the wheel spin freely but not too loose. Then attach the second nut until it touches the first nut, and tighten the second nut while holding the first nut so that those two nuts lock each other. The nuts can also be glued to the bolt to ensure it will not loose. 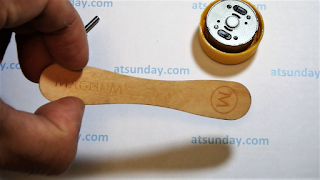 Attach the battery to the handle of the ice cream by tying it with a rubber band. The battery position on the ice cream handle is on the same side as the wheels, otherwise the motorcycle will not be able to stand upright. Make sure the bottom of the battery does not touch the floor, so that the motorcycle can run smoothly. This motorcycle is not equipped with a switch, so when the clip is mounted on the battery then the motor will immediately spin. To stop it simply by removing the clip from the battery.